Wind Sculptures is a photographic experience that present unpredictable sculpture created by the wind that only the instant of a high-speed camera can sculpt and keep it forever. A photograph as a sculpture and recorder of a performance. The entire project was taken around Europe, Italy, Greece, France, Switzerland, Portugal, UK and Iceland. The artist is also a subject of this theatrical sculpture where human and nature collaborate in a performance with even changing results. “The material used for my project is the same used by the coast guard to protect the migrants from the cold or from the sun as soon as they reach the coast from the sea. 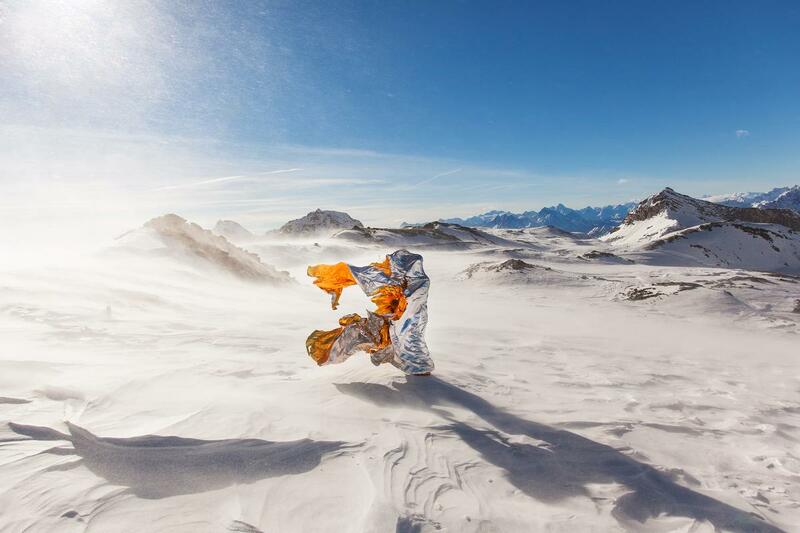 The thermal blanket is an iconic material, a symbol of salvation and generosity of the human being.” The material used for this wind sculptures is a thermal blanket, a special low-weight and very thin aluminium sheet, gold or silver, developed by NASA in 1964 for the US space program. It is used for emergency kits as a thermal insulation or as a locator beacon.